It has taken me over a week to process the adventure that my tired family survived since mid-July. From road trips to being a part of a family wedding, to the two week work-cation back in Fairbanks, our family has put some miles on our bodies this summer. The most recent trip to AK was capped off with an overnight set of flights that truly questioned my sanity! I knew it would be tricky, but living a long flight taking off at 11:40pm.. check that 12:40am destination time with 5 kids was almost too much! I've used these days following the trip to reflect on it all, and I've created a list of suggestions for parents that may have to choose a late night flight or are flying with kids at all. 1) Sleep. And I don't mean on the plane.. although if you can manage it, power to you! No, I mean that afternoon or a few hours before leaving for the airport. Find a way to rest up before leaving for the airport. I decided that the time leading up to the flight would be best used backing up the images my wife took during her photo shoots. No. Bad, Ken. That should have been done earlier in the trip! Rest was important. In fact, I would suggest even putting the kids to bed in the normal routine, so that they get a few hours before heading to the airport. We tried a few movies, and hanging out with family. That ended up being too much, as several of them didn't handle the exhaustion too well (my oldest 2 if you can believe it!). 2) Food. As many snacks as you can bring in fact. We tried to feed the crew a huge meal before we left for the airport, but in true form, all of them were hungry by the time we got to the gate. Thankfully, I packed an assortment of snacks (nuts, pretzels, Goldfish Crackers, and fruit&nut bars). The kids ate pretty much everything. If bringing snacks isn't in your skill set, you can always pick things up at the airport, or on the plane. 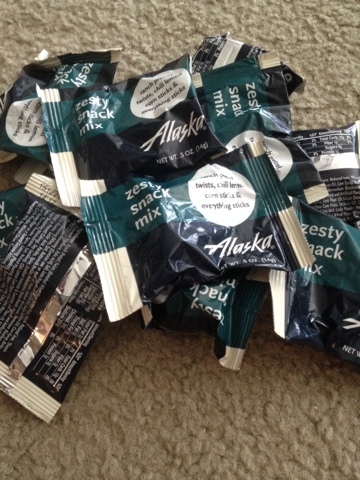 We typically fly Alaska Airlines, and for flights that are more than 2.5 hours, they offer warm food for purchase. We've tried the Fruit and Cheese Platter as well as the Mediterranean Tapas Pack. We have also found that the flight attendants know this too, and hand out plenty of extra snack packs! "Is that an old Game Boy?!" 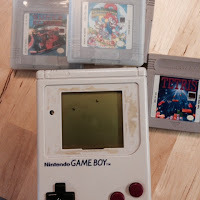 than a new/different electronic experience! Luggage also makes a great pillow! 4) Luggage. One trick that we use with the kids, is to make sure each of them has at least one bag or backpack that they are responsible for while we are walking through the airport. This typically isn't too hard, especially since we ask them to pack that bag themselves, so they take it very seriously. Our oldest packed plenty of his favorite books, while the younger kiddos included a lot of little toys and trinkets that never got a look while we were on the plane. I also through in some activity books and snacks so that each of them had other things to occupy them on the plane. The other luggage suggestion is to check your bags. I know that time is precious, and some of us have trust issues with airlines regarding baggage. 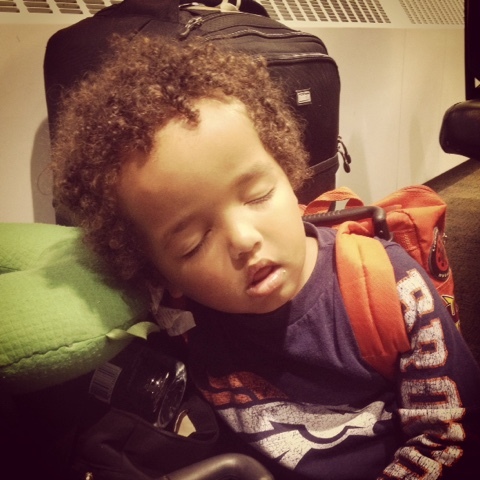 But for your sanity, when traveling with small kids, check as much as possible. We fit all of our clothes, shoes, and toiletries for 7 people in 4 suitcases that we checked. Sure that all costs money anymore with airlines charging for bags, but it's worth it when you don't have the stress of additional bags to lug around while safely wrangling kiddos. It also helps to plan who is sitting where prior to getting on the plane. This prevents fights and arguments from happening between the kids about who is sitting where once you're on the plane. "NO, I want the window!" When there is a line of adults waiting to find their seats as well... that doesn't go over well. So, tell the kids where they are sitting. Line them up that way as you board the plane, and if it helps, have bribes ready to go: "Well, I have a bag of gummies that says you're sitting in the aisle." And the last thing about seating, take the early seating if possible. "We are now boarding those that may need extra time getting on the plane, and families with small children." Take that! Get on the plane, get settled, and for your enjoyment, watch the happy faces of the people walking by when they see your wonderful family sitting ready to go! Alright, those are my top 5 suggestions for airline travel with multiple kiddos, and overnight trips. We have traveled a lot as parents, and have heard over and over how great our family is as we get off the plane. Remember that there is no reason to dread this time. Traveling is an adventure. Some kids totally dig it, while others are going to be more nervous. We have kids that fall into both of those categories. If you stay organized, calm, and loving everyone will have a great trip! Tell me about a trip you've taken with your family in the comments below. Do you have any suggestions that I missed? Do you have a travel nightmare story? You can also see more images of our trip on Instagram under the hashtag #travelingfamilyof7 or some of the fun tweets with same hashtag on Twitter. Also, please "like" my new Facebook page, click here. This is going to be the new center of The Teacher Dad universe! Thanks!